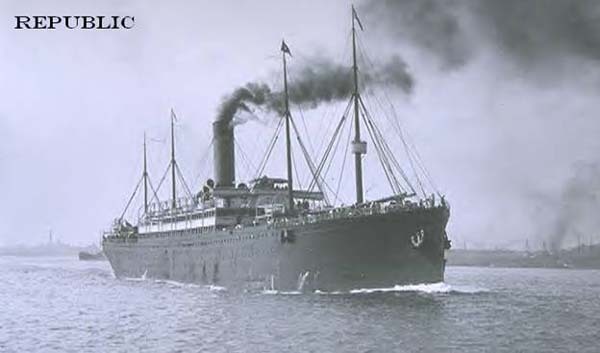 Columbus was built for the White Star Lines sister company, the Dominion Line. Her maiden voyage from Liverpool - Boston began October 1st 1903. By December of that year, she had been transferred to the White Star Line to be operated under the name Republic. The following year saw the new owners use her on cruises out of New York - Mediterranean. On one such cruise, Republic departed New York January 22nd 1909 bound for Naples via Madeira. At six in the morning the following day, she encountered heavy fog when approximately 175 miles from Ambrose Lighthouse. The poor visibility forced the Republic’s captain to slow his ship and sound her horn at regular intervals. This standard procedure failed to prevent a near catastrophic disaster as the Lloyd Italiano Lines 5,018-ton Florida on route to New York rammed the Republic on her portside aft of amidships. With the Republic’s engine room flooding and losing power, her captain ordered that a distress call be made on the Marconi radio. Fortunately for the Republic, this new communication system had recently been installed on most transatlantic ships. 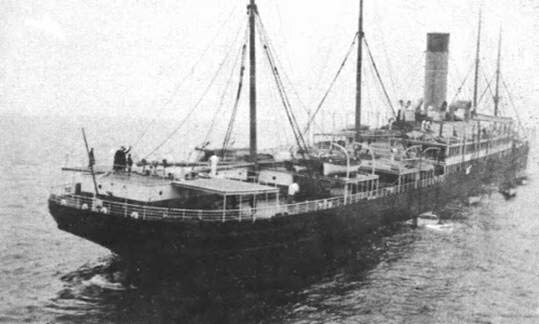 The White Star Lines Baltic arrived at the scene to find the Republic’s passengers had already been transferred to the not so badly damaged Florida. With the small ship overloaded and her hull in a damaged state, all passengers were transferred to the Baltic so they could be taken to New York. The American coast guard ship Gresham attempted to tow the Republic into port the following day. As they were attaching a towline, it became obvious they were too late to save the ship and pulled back to watch her sink. The following inquest blamed the Lloyd Italiano Line for causing the collision. This forced them to sell the Florida so they could pay the White Star Line compensation for the loss of their ship.